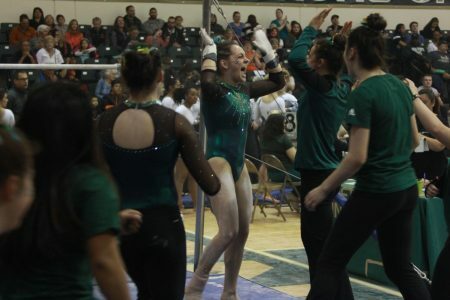 Sac State sophomore gymnast Courtnee Marquez celebrates with her teammates after hitting a career high on her uneven bars routine. The Hornets recorded a season high score of 192.600. 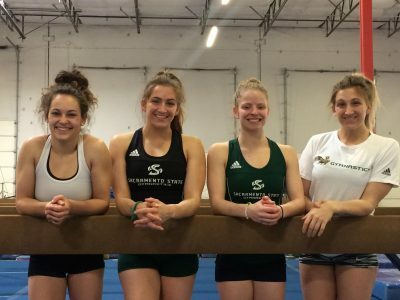 Sacramento State gymnastics scored a season high on Friday to defeat San Jose State with standout performances from freshman Shaye Mathias on uneven bars and sophomore Jordyn Brent leading on the floor and all-around. 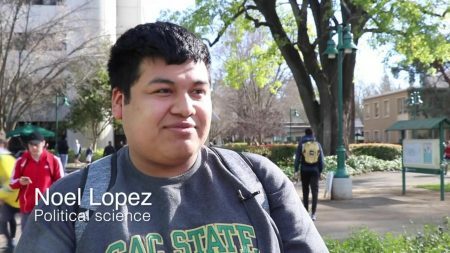 Sac State secured a win with a narrow lead against San Jose State and won 192.600-192.500, a season high for the team. 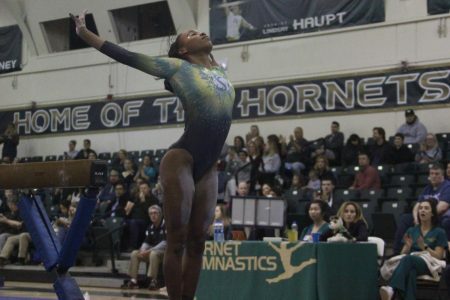 Brent set a career high with an all-around score of 39.050, tipping the Hornets to victory with her leading performance on the floor, a career high of 9.875. 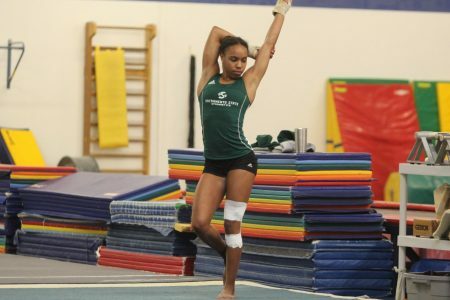 Sac State sophomore gymnast Jordyn Brent hit a career high on her all-around score and hit a career high on floor. Brent recorded a 9.650 on the balance beam. 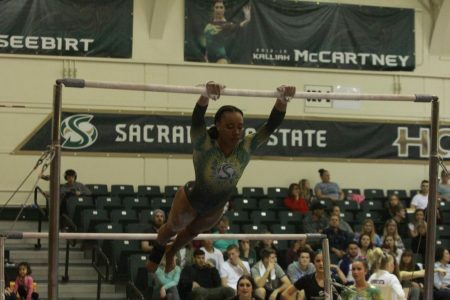 Another area Sac State led was on the bars, with Brent tying her career high of 9.850. 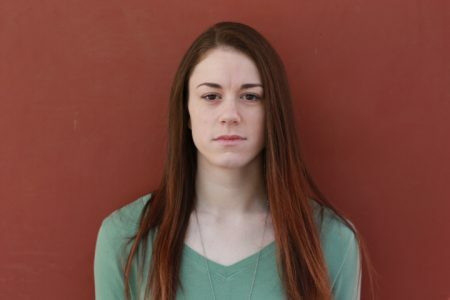 Following up Brent’s score was sophomore Courtnee Marquez, also setting a career high with a score of 9.775. 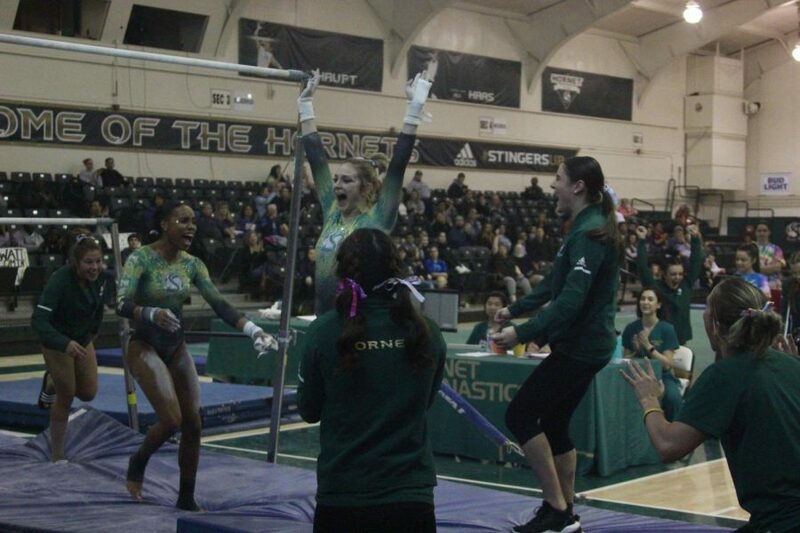 Other notable highlights from Friday include sophomore Kendra Braida’s performance on the beam. 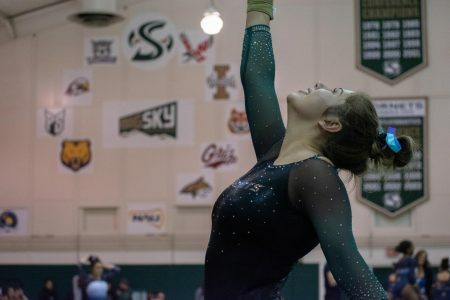 She opened the rotation with a career high of 9.850, where her score remained in the lead until a final performance from Chelsey Andrada of San Jose State beat out her score by .05. 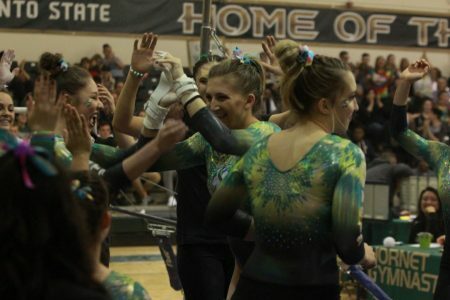 By the end of the night, Brent held three distinct titles from the leaderboard: bars, floor, and all-around, giving the Hornets the lead they needed to beat the Spartans final score of 192.500. Mathias said the team has been working hard all season for this moment. 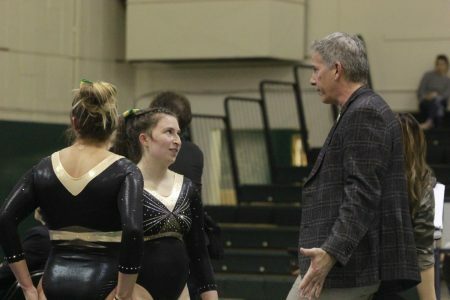 After starting out the season never going over 191 in the first three meets, the Hornets have now hit season high marks in consecutive weeks. 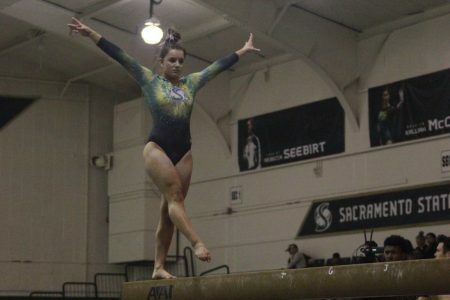 Sac State freshman gymnast Shaye Mathias hit a 9.725 on her balance beam routine and tied a career high all-around score of 38.250.